When the analysis of the biography of the 19th century philosopher J.S Mill is confronted with Maslow’s hierarchy of needs, what emerges is the truth about the destiny of human life. “Something must happen – because it is forced upon us by an internal force within us – the urge to be happy. Some things (even of the kind that are to do with the greatest needs and desires) will never stand a chance, because our body is the borderline of our being.” Mill’s case inspires optimism; in spite of the drastic drill he had undergone in his childhood and his nervous breakdown, all in all he was “luckier” – he found the woman of his life, but also self-fulfillment without having given up his predispositions or “calling”. Those who are not so lucky can still enjoy the pleasure of searching. What fascinates me in the performances of the Otwock Commune is the rift between their outlook on the world and the laborious effort of forging their comprehensive, avant-garde theatrical form. This rift, or fissure, the non-adjustment of various elements, is what gives birth to the dynamics of their theatrical performances. (…) The hero of the spectacle – a combination, or hybrid of wise men’s theses – is a continuation of the characters from other performances by the Commune. It was paper and experience that produced Perechondik/Bauman as well as Baader/his children. With the help of these creations the Commune examines the idea of performing good deeds. It shifts its emphasis form “humanity” to “the person.”From the society to the individual. It is hard not to see the dirty melancholy of Mill/Maslow. The sweat of not believing in humanity. Those who are Otwock Commune fanatics will blame the performance for its excessive lucidity, will frown at the lack of the group’s former rapacity. 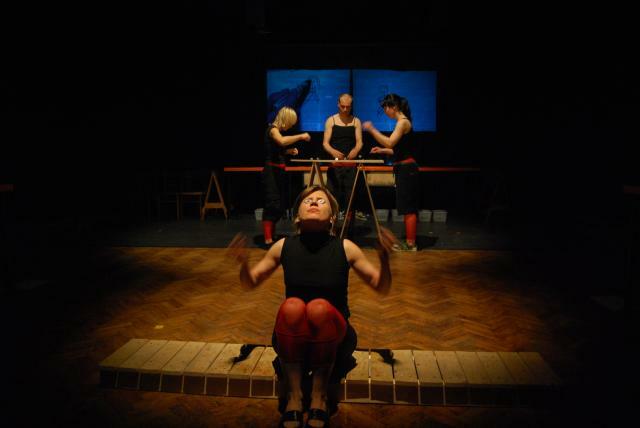 But for me what is most important in the Commune’s performances is the brilliant breaking up of clichés – hence the literal beating against tables, against the floor. Bathing in the box on the stage cleanses the actors. Walking in water-filled containers brings to one’s mind the balls and chains of convicts. Ready-made formulas will always be like fetters to us. The Commune does not believe in recipes for life (it is through clenched teeth that the actors shout out empty statements about happiness) and, like always, opt for each individual’s own answer.